“Call me Mooch,” were the girl’s first words upon emerging from the lion’s jaws. Before he could make out these words, Orlando Spinks had to pry her loose from the lion’s rubber teeth. Before he could do any prying, Orlando had to wake up. At the age of seventy-one, plagued by a tricky back, he no longer slept well at night, but he made up for his insomnia by napping at work. Thus Orlando was dozing in the control room of the New Boston Disney, from which he reigned over his menagerie of robot animals, when a hooting siren jerked him awake. He clapped the pith helmet on his bald head, surveyed the monitors, then rushed to the cat house, where he found a bunch of school kids swarming around the lion’s cage and yelling bloody murder. About as many of the schoolies were cheering for the king of beasts as for the victim, whose lower half protruded from the grinning lips. Some were yelling, “Save her!” or words to that effect, while others hollered, “She’s dead meat!” Instead of hanging slack or jerking about in terror, the girl’s legs—clad in baggy, purple trousers—stood firmly planted on the floor of the cage. She had jammed the mechanism by thrusting her head and shoulders into the gaping mouth when it was in the midst of a speech about the vanished jungles of Africa. In place of the lion’s voice, there now issued from the cavernous throat a child’s bemused humming. After decades of abuse transforms the world into a toxic wasteland, people flee into the safety of a global network of domed cities. Within these safe, orderly spaces, the only animals allowed are machines in the new world's mechanized zoos, called disneys. Orlando Spinks prides himself on keeping his father's disney spotless and orderly, until 13-year-old Mooch explodes into his life and down the throat of a mechanized lion. Mooch quickly wriggles her way into Orlando's heart with her mechanical genius, fiery spirit, and passion for real animals. As her rebellious spark spreads to Orlando, they restore the wild spirit to the mechanical beasts, but catch the eye and ire of the Overseers. 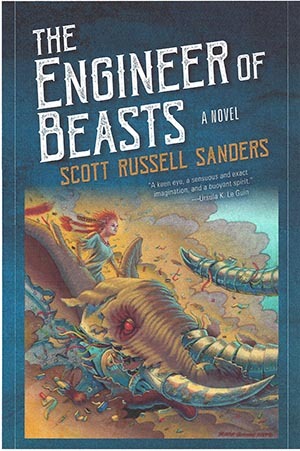 Beautifully written, The Engineer of Beasts brings together the best of Scott Russell Sanders's environmental wisdom with skilled world-building and beloved characters.